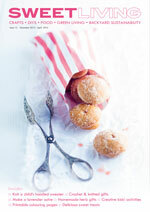 Did you see our delicious vanilla whoopie pies in Sweet Living Issue 4, page 22? We thought you might like the chocolate version too. It’s easy. Simply use the same recipe, but instead of 2 cups of flour, use 1 ½ cups of flour and ½ cup good quality cocoa powder. Add food colouring to the cream cheese filling for a lovely contrasting colour.